Increased taxes on vehicles, introduction of fuel tax, and banks lowering the amount car buyers can borrow have done little to dissuade people from buying new cars. More than 8,000 cars were imported during a one-year period between July 2014 and July 2015. This means about 22 cars hit the roads everyday. The increased number of vehicles has brought new concerns on traffic jams and bottlenecks. According to a study carried out by the World Bank, should the present trend continue it would take more than one hour to reach Babesa from the city centre. Today there are 74,612 vehicles in the country, which is one vehicle for every 10 individuals. Of the 8,191 vehicles imported since July last year, 518 were government vehicles. In the same period last year, when the ban on import of cars was imposed, the Road Safety and Transport Authority registered only 576 vehicles. 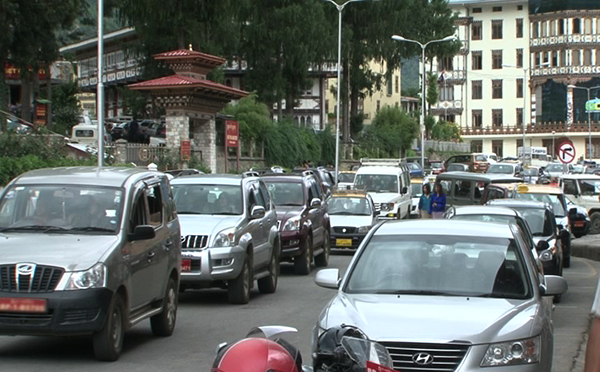 Of the total number of vehicles in the country, about half of them are concentrated in the Thimphu region. Phuentshogling has the second highest number of vehicles at 26,608. Unless safe and reliable and regular public transportation are put in place, individuals have no option but to borrow, beg or sell ancestral property to buy private cars.